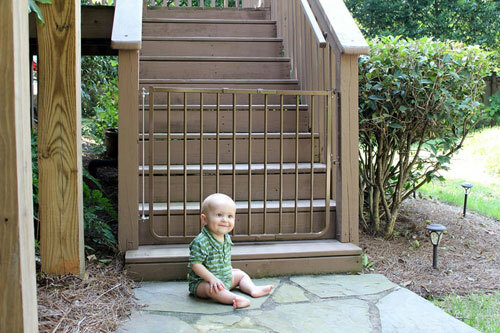 When looking for a safety gate that is both reliable and modern, a metal baby gate can be a solid choice. 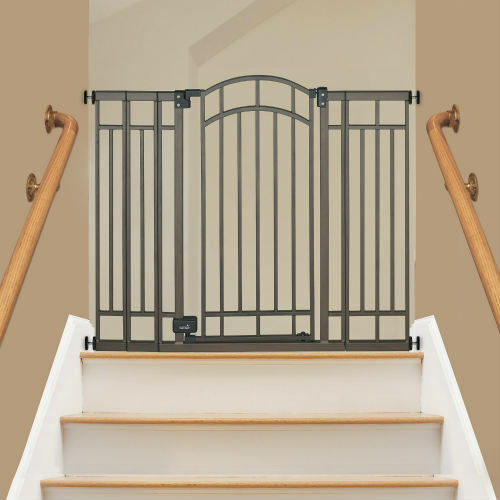 In addition to their nice aesthetics, metal baby gates often have sturdier doors with better opening mechanisms. 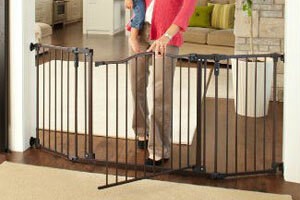 North States makes some of the most popular metal baby gates available. This model, their Superyard Arched Decor Metal gate, comes in a beautiful matte bronze finish. A bronze metal finish is a popular choice for a modern look, while many metal gates also come in white as well as the occasional black metal. 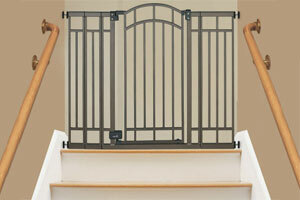 Compared to wooden, plastic, and mesh baby gates, a metal baby gate is sturdier and heavier. 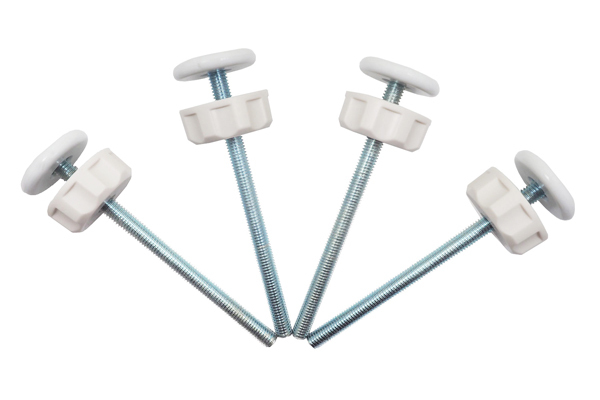 Even with its extra weight though, many metal baby gates can be pressure mounted, in addition to the also common hardware mounted metal gates. 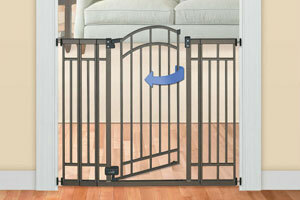 Metal baby gates can really vary in price a lot. 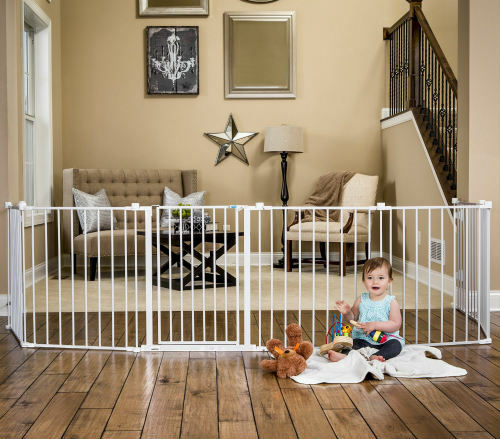 Some of the cheapest metal gates can be found in the $30-$40 range, while nicer metal gates can run $60-$80, while extra wide metal gates and play yards can run $100+. 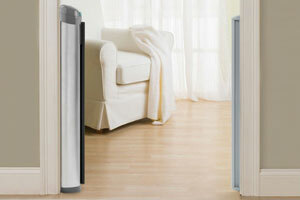 Let’s take a look and compare some of the best metal baby gate models of different price ranges and colors below. 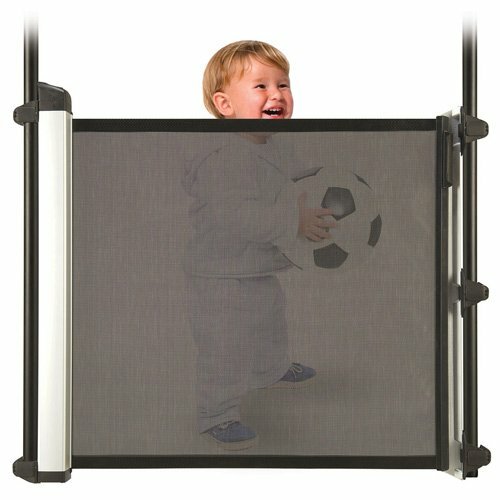 Hopefully the comparison table above is useful in quickly comparing some of the best metal baby gates available on the market today. Read on below for more details on some of the individual models in different colors. A bronze metal gate is a great aesthetic choice for indoors in a modern house. It’s a color that looks great on wood floors and provides a clean looking contrast that complements a lot of homes. It’s also one of the most popular colors for baby gates. 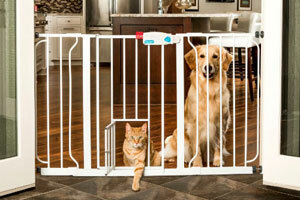 North States Industries, maker of the Supergate brand, makes some of the best bronze metal baby gates. 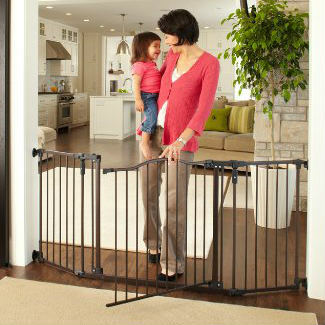 And Summer Infant’s bronze metal walk-through gates are also very popular and highly rated. If you’re looking for a more subdued and even cleaner look, white metal is a great finish that is available on many different types of gates. Regalo is perhaps the most prolific manufacturer of quality white metal gates. 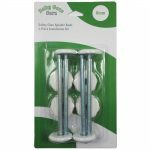 They carry narrow pressure mounted gates, extra wide pressure mounted gates, top of stairs gates, and their popular 192-inch Super Wide Play Yard gate, all in white. 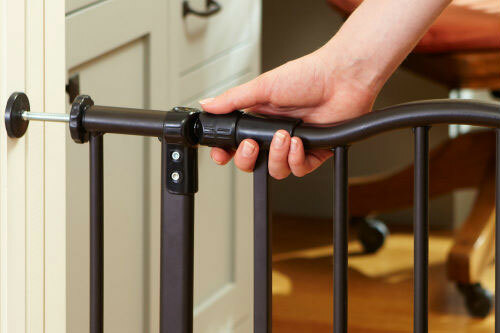 A black metal baby gate is also a popular color choice for indoors, but it is slightly less common to find available. Regalo makes a popular extra tall black metal gate called the Deluxe Easy Step. In addition, Dreambaby has a model widely available in black that is JPMA certified called the Chealsea Auto Close Security Gate. 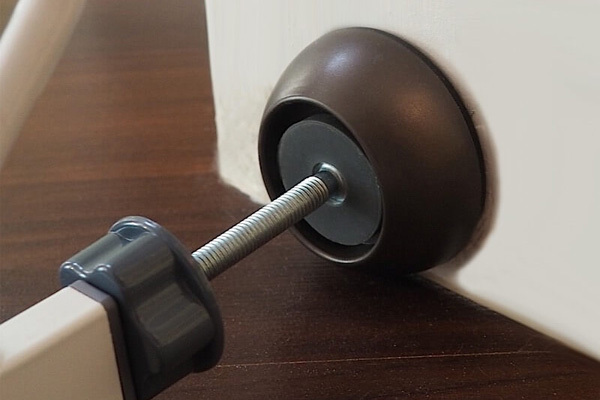 From there, black metal baby gates are harder to come by from the bigger brands, but there are also a number of slightly lower rated options available in black from smaller brands.